Terran Calendar: The current year is 29 AO = 597 WTA. All new threads happen during the current year unless otherwise stated by the creator. Newer information at the top; keep up with the latest in the Updates thread. Visible to the entire continent, the sun burns green for ten minutes. 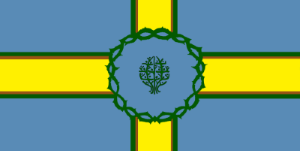 During the events of the Civil War - Phase 2, a number of different factions have established themselves in the greater Wilds of Terrenus and are poised to become enclaves with sovereign leadership. This has added new territories to the map: Aligoria, Chesterfield, Everrun, COTH, Temple City, Nesthome, Anima. Due to the events of the Civil War - Phase 1, transportation across the nation of Terrenus has been crippled and magical availability has been concentrated in the Shawnee Wastelands. 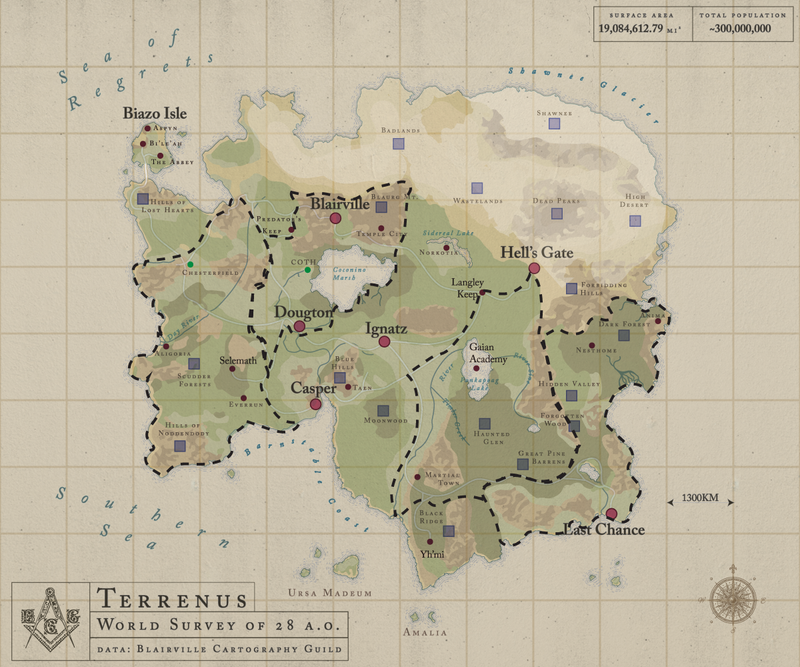 Located in the north-east of planet Valucre, Terrenus is approximately twice the size of the North American continent and has a citizen population of approximately 300,000,000 (three-hundred million) as of 24 AO. A dense arcanosphere has resulted in sections of unpredictable climate and terrain. The fluctuating levels of magic also lead to random side effects on plant and animal life, and has been noted to render gunpowder unreliable in greater Terrenus (this is meant to prompt creative alternatives to basic firearms). The tip of Ponkapoag Lake will be used as the central marker for description purposes. The area enveloping Ponkapoag Lake and Coconino Marsh is characterized by warm, dry summers which average 66°F with low precipitation and cool, wet winters which average 25°F and moderate precipitation. Evergreen and deciduous trees, fig, walnut and citrus trees, and bay rosemary herbs thrive in the area. North of the central marker the weather increases sharply in temperature and vegetation becomes sparse as grassland and forest biomes turn into desert, which average around 100°F with pronounced dry periods. The desert biome is expansive but is at its north-eastern section is abruptly interrupted by arctic tundra. South of the central marker, the climate features warm summers and cool winters with a narrow annual temperature range. There is no dry season in this section, precipitation ranging from moderate to heavy, and the forests are temperate, especially in the Great Pine Barrens. In Amalia, Ursa Madeum and Biazo Isle, year round temperatures are consistently a humid 75°F and are dominated by precipitation, especially during monsoon season. Terrenus has plant and animal life recognizable to most characters, such as: flowers, trees, dogs, horses, crabs, salmon, etc. and so on. In addition to this standard there are a number of animals and plants unique to Terrenus. You can read more in the Terrenus section of the Terrenus Creature Codex, the Terrenus's Herbology Index and Herbalism 202. Terrenus has ten megacities (originally 12, two have been lost to major ruin or a shift in politics) and numerous disparate villages, towns, baronies and lordships around the nation. The major cities are population dense and, thanks to magi-tech introduced with Odin Haze's sweeping regime, vary wildly in setting and tone. Outside of the major cities the Terrenus wilderness is mystical, savage and untamed. It is not uncommon for the citizen or amateur adventurer striking out on their own between the cities to find death as to find fortune. A citizen living within one of the megacities is literate, adequately versed in magical theory to make use of Terran magi-tech, is aware of common metaphysical phenomena (ghosts, rituals, telepathy, charms, hexes, etc), and is often capable of using magic as a result of scholarly pursuit and understanding. A native from one of the towns or villages is less likely to be literate and have empirical insight into arcana and magical phenomena. Instead, their knowledge of ability to use magic is a result of hereditary traditions and cultural myths. Their understanding of magic is intuitive rather than logical, making them more susceptible to charlatans and superstitious fears. But, with generations of experience springing from tradition, the villages produce more young people capable of wielding powerful, ancient magic. A Terran from any part of the nation tends to be physically robust due to Gaian religious practices and Terran diet. They have a special love for music, having considered music the universal language before they discovered mathematics and magic, and as a consequence also enjoy indulging lavishly in food and dance. Terrans celebrate not just their history, but their art throughout their ages as well. Terric is the primary language of Terrenus. It is spoken in all megacities and most towns, though becomes rare in isolated villages and islands, where a pidgin form of modified Terric of varying names (Terril, Terrin, Terrie, etc) is usually the norm. Terric's primary dialects sounds like Spanish (users should treat this as a plot device and are not expected to learn how to write Spanish). Other dialects sound close to Romance-influenced language, such as Italian and French, but will also deviate into Germanic-influenced languages. The rarest language in Terrenus is Oldspeak, which is practiced by less than 1% of the population. The language requires line of sight and has no verbal components, instead communicating complete ideas between speaker and receiver. The Terran federal government has published a white paper on the Terrenus laws of magic, an authoritative perspective on the laws, principles and terminology of magic as they apply in Terrenus. Also note that with events between the Wastelands and Shawnee loci during the Safeguard riots, magical availability in Terrenus has been reduced everywhere except the new boundaries of the Shawnee itself. Gaianism is Terrenus's major religion, constituting over 79% (down from 83%) of the total population. Gaianists consider nature, the universe, reality, magic and mathematics to be mortally comprehensible expressions of an inconceivable deific form. Gaianism advocates peace but not blind pacifism, leaving violence as a final solution and a mechanism for self-defense. The notable exception of this rule are Unnatural (any offspring of dark necromancy, such as vampires, zombies, liches, and occasionally Outsiders). Gaians attack Unnaturals on principle unless the Unnatural has taken pains to prove themselves righteous. The Cothic church is a small but growing religion, numbering approximately 5000 faithful. The Cothic religion was born in Coth, in the land between Dougton and Blairville. The Cothic church is a breakaway sect of mainstream Gaianism with worship of a new deity and populist ideals. The Cothic church seeks to underscore the weakness of any mortal being aspiring to power and instead advances taking up a permanent covenant with the Cothic god. Technology in Terrenus is highly advanced, arguably some of the most advanced on the planet. Although this fact not immediately grasped by foreigners accustomed to development in the form of electrical and mechanical contrivances, Terrenus is the historical pioneer of magi-technology on Valucre, democratizing and automating a great deal of otherwise obscure and hidden knowledge. Terran tech is rooted in cores of abstract knowledge, interlacing philosophy, natural and conceptual science, and magical theory to pioneer the current paragon of magi-tech in Valucre. Terrenus has sentient golems where another country might have "robots", rock satellites powered by runes and divination lattices, and crystal-based tactile computing systems instead of console based computers one might find elsewhere. In this sense "technology" is something learned and understood rather than picked up and used. For this reason education, especially developmental and postgraduate education, is of vital importance to the government. The newest generations of children show an adept knowledge of magical theory, a strong grasp of complex mathematical concepts and explore unconventional modes of thought. Like with telecom availability (see below), technology and magi-tech is the most advanced in the cities and attenuates as one goes into towns and then villages. Following the introduction and proliferation of magi-tech in Terrenus, economic concerns shifted to prioritize three new markets: Energy, Information and Transportation. With the explosion of communication methods, primarily in the form of crystal storage devices and photonic relays, came the immediate concern over authentication (assurance of claimed identity), integrity (assurance data has not been altered), and confidentiality (assurance that none but specified parties can read a piece of data). To those ends, Terrenus also pioneered the fields of encryption and hash algorithms, non-repudiation practices with digital signatures, and now with the advent of the Crook, the Public Encryption Cipher System (PECS) to allow civilians and citizens the same capabilities. Military technology and ciphers are known to be highly advanced, though private and public technology is catching up as corporations invest in the Information market. Terran military-grade communication systems use quantum entangled encryption to prevent interception. Systems create entangled photons, beaming one half of each pair to the receiving system, and made secure because the "observer effect" will change the quantum state of the key pair. This would make any interception obvious and also would modify the key, making it useless. A notable outlier demographic to the conventional communication methods in Terrenus are those that are fluent in Oldspeak (.7% of the population), who are limited by line-of-sight but require no material channels for relay. As with other gifts of the Empire, the most sophisticated technology and methods tend to exist in the megacities and attenuates as one radiates outwards towards the smaller, more numerous towns and villages. One notable exception are the twinned crystal relays created and distributed by the government to any signification population center. These allow for easy, long-distance audio communication between any parties with properly tuned crystal fragments and without the need for complicated training. These simple but effective radios have drastically reduced missing persons reports and increased cultural exchange. Villages: Tribes and villages use magical means to communicate where possible. Examples of this include telepathy, oneiromancy (dream-walking), divinatory practices with water, smoke and mirrors, and shamanistic practices like reading tea leaves and animal guts or bones. Where these means are not available, visual communications rely heavily on beacons, smoke signals, and flags and audio communications rely on coded drumbeats and whistles. Towns: Towns use copper and nth wires run over natural ley-lines, piggy-backing on their natural radiation to power the communications. With this method towns are able to communicate with equivalents to telegraphs and telephones. With the advent of Tia's faux-ton relay system, towns are now able to communicate with line-of-sight-limited laser communications at millisecond speeds. Cities: Communication systems in the megacities make full use of magical theory and the technological capabilities of the nation. Three-dimensional holographic arrays (holo-arrays for short) are used primarily for relay on politics, economics, weather, and criminal activity. These relay systems make use of the military satellites and are capable of radiation communication (radio and microwave). The World Fair introduced three new pieces of technology which greatly influence communications in Terrenus. The first is the LIES (Luminal Illusion Entertainment System), an immersive storytelling platform which is having a notable growth effect on the Entertainment sector. The second is the 'logical' Crook technology, which allows for the lossless interlinking of disparate crystal computing systems. This allows for the creation of ad-hoc, large-scale networks and what is being termed 'nebulous' storage. In tandem with The Storage Movement's efforts to digitize all written information, the Crook is widening information availability and increasing literacy. The third is the Faux-Ton, a materials transportation system invented by the Tia government which allows for the movement of objects at speeds many multiple that of the Lightning Rails, but limited by line-of-sight. Transportation varies between cities depending on their magi-tech saturation and biomimicry level. Below are standards found across the nation. Often used for inter-city travel. Often ridden alone or attached to a cabby. The maintenance and upkeep of a living transport makes this a largely inefficient form of inner city travel, but because a large percentage of a given city's population are short-term travelers from abroad (international foreigners, inter-city adventurers, non-natives that live elsewhere on the nation, etc), animal propulsion is still fairly common. A lot of infrastructure continues to supports this form of travel. Horses (ground), Imperial Drae (aerial) and Rider Dragons (aerial) are common mounts. Often used for inner city travel. Automatic wagons with steam-engines produced in Tia and gyroscopically rotating spheres with a stable core produced by Gaian engineers in Hell's Gate are the two most common examples. In densely packed city infrastructure, powered zip-lines are occasionally employed between buildings. Sea-ships and air-ships are common for travel around and between nations. Submarines, which Terrenus invented and introduced into the world as a counter to the Siren menace, are predominantly used to the military but are becoming more popular among wealthier merchants. Inter-city travel used to be served primarily via Rail and Gate, until consequences of the civil war combined with supernatural phenomena to cause catastrophic damage to both and bring them offline for several years. Tia's Faux-ton system is growing in popularity but has limited application until more pylons are built, able to serve only Tia and Biazo Isle at the moment. Lightning Rails - used to be magnetically propelled trains capable of traveling several hundred miles an hour. Currently offline. Tracks are used by slower, simpler, privately owned carts and trolleys for now. Warp Gates - used to be stabilized portals and the only reliable method of teleportation in Terrenus. Currently offline. Faux-ton System - Tia patented technology that converts matter to energy to achieve subliminal travel speeds. Currently online but limited in presence. Odin Haze is recognized as the Saint of Gaianism and King of the Terran Empire. Odin's rule is one of enlightened absolute monarchy, and his administration embraces logic and expertise as the driving force for fiats and policy. The arts, sciences, education and social welfare all flourish under Odin's regime, a near polar opposite to the dark ages of King Levas and Zengi. Though Odin Haze rules Terrenus as a whole, the megacities under him are ruled over by individual regents that interpret federal law and administer local policy. Some are federally appointed, some are democratically elected, some are rulers by heritage; political states are a very fluid dynamic in the megacities. Each megacity also has a PeaceKeeper, a high-ranking military official to add balance and division of labor. There are also present in the massive Terran continent enclave baronies and kingdoms, which are independent governments. Examples include Taen, Predator's Keep, and Amalia. The Gaian Academy is a national research university located on Deepview Island, an inland island and part of the Ponkapoag Lake Archipelago. It is the premier education center in the nation, some say even globally, and has also begun to establish itself as a competitive research facility. The Safeguard Act - Prohibits the use of unlicensed magic in specific cities. In each city there's a congress, which is made up of majority and minority leaders from each city. The majority leader is the elected official of a city (usually but not always), and the minority leader is usually the one who lost the elections but still represents a significant portion of the electorate. The king decides on issues which affect everyone. If regents are in conflict about any change, the king is the final word and can supersede any motion. The king also appoints chief of staff for various departments, such as the head of the military, the bureau of science, internal investigations, as well as determines who makes up the supreme court out of nominees put forward by the congress. In criminal investigations Terrenus law enforcement makes use of various forms of divination, in particular retrocognition and psychometry, as well as Gaian candles of truth and clergy to compel honesty. Each megacity has at least one maximum security prison to house the most dangerous local criminals, such as terrorists, political prisoners, the excessively violent or those with gang affiliations. With Terrenus penology skewing towards rehabilitation rather than deterrence or retribution and treating most criminal offenses as mental health issues, the megacities also have a larger distribution of minimum security prisons for non-violent offenders. Minimum security prisons populate the city at the ratio of 1:15 compared to libraries, hospitals, and schools. Terrenus also has one super-max prison in the Dead Peaks, aptly titled the Dead Peaks Prison. The Dead Peaks Prison is the most secure level of custody in the nation, purpose-built towards providing long term, segregated housing for inmates classified as posing a threat to national health (a classification that designates one a danger to people or life rather than to information or infrastructure) or international security risks. Recently the Dead Peaks Prison has gone offline with the loci event that saw the Shawnee Glacier covering most of the Wasteland. Terrenus exercises capital punishment nationwide for criminals that pose an unmanageable threat or show no potential for reform. Terrenus Military is made up of ~2% of the population (approximately 6 million). Odin Haze, as King of Terrenus, is also its Commander-in-Chief, exercising total authority over the military. Edward Brown (5-star General and PeaceKeeper handler) is Odin's right hand man and adviser, the highest military authority other than the King himself. He is involved in the day-to-day responsibilities of maintaining the military, government, and nation. The complex that stores and relays information, innovates military technology and strategy, and is responsible for national security is known as Central. Despite its name Central has no central location. It has a manifold presence throughout the nation, and those few offices that are permanently stationed and open to the public are often underground. Note that this enigmatic and transient nature applies to the most secure aspects of Central and do not apply to the various local agencies found in the cities such as Immigration, Sanitation, Education, local Law enforcement, and so on. The path to citizenship in Terrenus requires a 2 year service in the military (or ranking to Sergeant) and bestows the ability to vote for officials and own and pass down land. In regards to foreign policy Terrenus is an autarky and practices a modified form of isolationism, declining to enter into alliances and international agreements, and generally attempting to make their economy as self-reliant as possible. Where Terrenus deviates from traditional isolationism is in their support of free trade, travel, and certain, limited, trade agreements with other kingdoms and nations. You can read more about Terrenus political relations in Terrenus Military - Allies and Enemies. A large part of Terrenus's internal economy is dungeon based, with adventurers taking on the high-risk work of crawling dungeons for the high reward of prized cultural artifacts and items of power; although this has led to some legal conflicts regarding ownership of artifacts, these disputes are generally handled in the courts after the adventurer has been paid for his or her legal reclamation efforts. Some towns and cities pivot around this, specializing in crafted weaponry, armor, and healing potions. Others are known to offer tours through cleared levels of dungeons and vaults for tourists. Because the task of increasing the nation's food security was the first and foremost priority of the Haze regime, understanding that one cannot create if one is starving, Terrenus focused its considerable resources on agronomy and crafted several techniques and tools for high-yield farming. This has greatly increased Terrenus's ability to self-sustain without foreign aid even when its economy falls. Terrenus exports a great deal of utility (i.e. non-combat) magi-tech and magical and scientific knowledge to other countries, and supplements its national income with submarine exploration of natural resources throughout the large tracts of Valucre which are underwater. Terrenus's economic and market systems revolve around precious metals. Crystals and other minerals are valuable as spell components but are not fungible. Copper, silver, gold, and platinum are the most common precious metals traded and used for purchase. Value is determined by weight and type, not by design or origin, allowing travelers and immigrants from other countries to more easily integrate. 1 oz of Rhodium = 500 USD. Each metal currency comes in fractions as well, such as half-ounce and quarter-ounce coins. These prices are not an accurate reflection of real world costs. You can read more about special metals and materials in the Terrenus Materials List. These events are from most recent to oldest. After the Crusades eliminated the majority of remaining Desecrator gangs and leaders, Odin unified Terrenus under the banner of Gaianism. He immediately put into place programs to develop educational institutions, reform criminal law, and helped pioneer magi-technology alongside Edward Brown and Eustace Monroe. From this sprang increased transportation by way of Lightning Rail and Warp Gate, as well as enriching quality of life, education and health for all citizens. The Empire is considered to be prospering under a golden age. The most cunning and ruthless of the nobles during Levas's reign prospered in his death. They filled the void of his power and inserted themselves into lucrative mercantile positions that allowed them to establish their families as enduring and financially powerful dynasties. With Zengi and his mad bid towards universal destruction no longer a threat or distraction, the most recent generation of those families form a "proper government" run by "proper men"; an oligarchy that concentrated more power and more gold into their hands, masquerading as a legitimate republic. Eventually the republic is exposed and the leaders systematically vanish without a trace. There are rumors that the Assassin's Guild was involved. The witch-king, also known as the Wyrm's Head, has no known origin and is referenced in the earliest known records of written history. Zengi cares only for destruction and ruin. There is no mention of his name where there is not death or pestilence shortly accompanying him. He is thought to be the source of the Queens's insanity, hundreds of years ago, as well as the worst plagues and diseases. The next century is one where all life knows only darkness and fear. Zengi seeks only to scar the earth and render it inhabitable for all life. In the chaos the Desecrators were created in worship and awe of Zengi's power. The Lions are a party of the final hopes of mortal-kind in Terrenus. From them comes Jason of the Lions, who sacrifices his life to end that of Zengi's, and in banishing Zengi from the physical world and restraining him in the spiritual, is himself turned to stone. Regents appointed during the diarchy continued to administrate over the plots of land to which they had been originally assigned. Levas the Cruel swept from east to west like a plague himself, gathering men for his army, women for breed-stock and currency, armaments as he conquered regent after regent and united the disparate territories under his iron fist. Levas's growing reign and consequent human affairs repulsed the King of the Fairies, who took his kingdom and retreated into the Moonwood. Almost immediately after the disappearance of the Fairies a fifth of the population contracts an infectious disease which kills over two-thirds of the infected. Levas is successfully assassinated by the Assassin's guild. Queen Ersela and Queen Hildena were two monarchs who, despite lacking any sexual or familial affiliation, united their kingdoms under their joint rule. The kingdom prospered until it was overtaken by a famine, which is speculated to have been the work of Zengi. This complicated economic depression led first to the downward spiral of the Queens as they went slowly insane and mismanaged their territories and funds, and then to the establishment of the Assassin's Guild which eventually took their lives.